One of my favorite features of the digital age is the ability to preview, not just a blurb or a flyleaf summary of a book, but an entire chapter. It’s true you can’t really judge a whole book from one chapter, but at the very least you can get a sense of the author’s style and see if the main character grabs your interest. 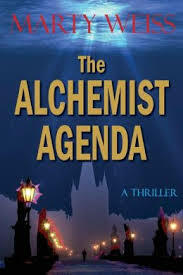 Having read both an excerpt (see my previous post) and the first couple of chapters of Marty Weiss’s The Alchemist Agenda I’m confident in recommending the book to anyone who likes the works of Dan Brown or Clive Cussler, or who grew up watching the Indiana Jones movies, although, Weiss’s characters have a much better command of witty banter. The first scene really hooked me as a reader – dropping me into the action and onto the deck of a rain-pelted ship out at sea, and maybe it’s because I’m a sucker for bad weather and good writing, and when you throw in shipwrecks and intrigue I’m completely in love, but I didn’t want my sample to end at the end of the first chapter. Seriously, you should rush right out and buy this book – I just did, even though I got the samples for free – and I can’t wait to finish it. Goes well with… a bowl of New England clam chowder (that’s the white kind), and hot tea served in those handleless Corning ware mugs the U.S. Navy used to use.